A SERIES OF SHOTS AIMED AT THE MORNING SKY, IMMEDIATELY AFTER THE BOOMS THAT BOUNCED OVER THE WALLS OF THE OLD BUILDINGS OF THE HISTORICAL CENTRE, ECHO IN THE ALLEYS UNTIL THEY FADE AWAY, WHILE IN THE SKY THE LAST TRACES REMAIN, TUFTS OF WHITE SMOKE CARRIED AWAY BY THE WIND. IT IS THE SIGNAL THAT EVERYONE IS WAITING FOR, THE COUNTRY FESTIVAL CAN BEGIN. The stages of an enchanting and interesting journey through the most spectacular religious festivals of Apulia, especially deserving of its plural denomination “le Puglie” in these circumstances in which it continues to celebrate it sacred dimension with ancient but still relevant events capable of evoking history and stories with a strongly collective element. The dense white smoke with the acrid smell of sulphur rises high in soft puffs mixed with shreds of charred paper into the May sky. It wraps and hides everything: buildings, things, the excited crowds, while flashes like lightning accompanied by ever louder ever closer together bangs fill the air. The tumult is everywhere and hundreds of young people, the “fujenti del Soccorso” run the gauntlet of the fireworks artillery, rocking in long lines, making room for themselves and just dodging the deafening multicolour shots. We are not in the centre of an outbreak of urban warfare this is the highest moment of tension, dangerously thrilling, of the annual festival dedicated by SAN SEVERO (FG) to Our lady of Help (Madonna del Soccorso). The bonfires, the “Sanseverese artillery” burn flame and explode along the whole route of the procession. After the fires, as the smoke clears, the statue of the Madonna with her ebony skin comes gradually into view, she is sitting and is dressed as a matron in precious clothes and a golden crown, and she seems to be incredulous at participating, eyes wide, in this noisy hubbub in her honour. In her left hand she has the blessing divine infant, in the other she holds the ripe corn ear and the olive twig signifying protection of the fields and harvest of the well populated area of Capitanata, once known as Apulia’s grain store. She is accompanied, in this solemn procession, by the three Archangels and the compatriots Severus and Severinus. To see scenes similarly loaded with tension and religious fervour, you have to go to the Catholic stronghold of Spain, to Pamplona which has been twinned with this town in the Province of Foggia, for the bull race in honour of St Firmin. At the other end of Apulia, deep in Salento, the new year is ushered in with fire: in NOVOLI (LE) the “focàra”, a giant stepped pyramid made with tonnes of branches left by the winter grapevine pruning, lights up the night of 16th January, the eve of the feast of the town’s patron saint, St Anthony the Abbot. The sacred flames that banish the frosts attract thousands of the devout and more and more tourists every year. The sainted hermit, who for Christ gave up the luxury and ease guaranteed by being born into nobility, withdrew to meditate in the Egyptian desert where he lived into his hundreds. He is invoked for the healing of physical bad health, and for the protection of pets and farm animals. Not long afterwards, on 30th January the eve of St Cyrus, another bonfire or “foc’ra” burns in GROTTAGLIE (TA). Ceremonial fires “fanove”, light the nights between 11th and 12th January in honour of Our Lady of Vetrana (Madonna della Vetrana) in CASTELLANA GROTTE (BA): evoke the miraculous intervention of the Virgin Mary to liberate the town from the plague in 1691. The celebrations are renewed on the last Sunday of April with a long procession where the statue of the Madonna is accompanied by a festive parade of dozens and dozens of statues of saints. St Lawrence’s protection of the people of LIZZANELLO (LE) manifested during the earthquake of 19th January 1833: since then the event has always been commemorated with a huge bonfire. In ACCADIA (FG) the bonfires are lit in honour of the patron saint St Sebastain, as in SPINAZZOLA (BT) where a prized silver bust of the saint pierced by a golden arrow is venerated. Thousands of candles, some of truly huge dimensions, in BITONTO (BA) accompany statues of the Saints Cosmas and Damian, whose worship is as healthy as ever. The “intorciata” takes place on the third Sunday in October at the same time as the end of the grape harvest and the traditional start in Apulia of the olive harvest. The procession with the huge “Turkish” candles is impressive, these candles accompany the statue of Our Lady of the Snows (Madonna della Neve) the patron saint of NEVIANO (LE) during the evening of 5th August. 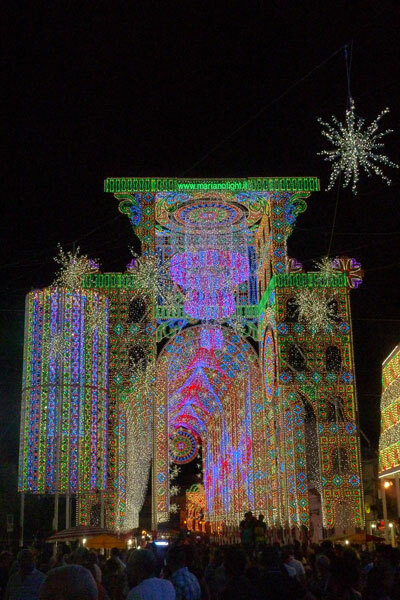 The underlying substrate of the absorbed agrarian cults are still visible and re-justified by Christian rites in the feast day of St Victoria “piccinna” (small) in SPONGANO (LE): on 22nd December the roads in the centre of Salento are the setting for the lighted “panare” procession, these are large skilfully woven baskets full of crushed olive pits and decorated with citrus fruit, ribbons and flowers. The rite celebrates the martyrdom of the saint who was burned for not renouncing her belief in the Christian God. In her turn Victoria absorbed the role of the divinity protecting the fields and the crops protecting them from unforeseen events: the summer feast day on 8th August celebrates the divine intervention of the saint defending the harvest from hail. The fires that burn through the night between the 1st and 2nd of November are in honour of the souls of the dead the “cocce priatorije” or heads of Purgatory, and light every corner of ORSARA DI PUGLIA (FG) giving it the appearance of one of the circles of Dante’s Inferno: green branches of broom (a plant that has signified the sun for thousands of years) are placed at the top of the bonfires and splutter as they burn creating “scattelle”, noisy sparks that scare away evil souls. All around and throughout the night, the atmosphere is festive, and there are cakes and pastries, vegetables, roast meats, and wine, while on doorsteps and windowsills, or in improvised parades, people display their large carved pumpkins with candles inside taking in the form of sinister heads known as “cocce priatorije”. This is an ancient tradition and was shared by many other Apulian towns in the past and not derived from the Americanised Hallowe’en horror fancy dress fest that has recently been imported. Not fire but fireworks, those pyrotechnic effects are the protagonists of the feast day that every year in November light the sky of ADELFIA-MONTRONE (BA), for hours day and night. These are let-off in honour of the martyr Tryphon who earned the place of patron saint for saving the community in the mid-1600s of a pestilent disease and then (like in Alessano and Cerignola) for protecting the fields from the scourge of locusts whose mere appearance was an omen of famine and death. That of Montrone is a sort of “sampling” of festivals, an unmissable event for every member of the “committees” who in this way can see what is new and hire bands, “fire starters”, “illuminators”, “ball masters”, for the religious celebrations in their respective towns. In Montrone the “walking bands” and “illuminators” also show their best. The illuminations are of a beauty and size that are truly extraordinary with patterns, arabesques, flowers, and architecture where the inventiveness of the creators has free rein, like in COPERTINO (LE) for St Joseph’s day (19th September) and especially in SCORRANO (LE) for St Dominic (6th July) where you can see the most beautiful and original lighting effects of them all. The festivals we have cited above are just some of the events measuring out the year on Apulia’s rich and extensive calendar. The substrate of archaic beliefs shows through and together with the Catholic rituals shows us the long and not always linear process of acculturation where the magical pre-Christian beliefs which ensured protection and allowed people to face situations that were difficult for the individual and community, were gradually absorbed by the Christian devotional acts, symbolism and behaviour. The feast days are a moment - even more so in the past than today - of plentiful food in anticipation of individual and collective welfare. In some towns in the so-called “Albania tarantina” (Faggiano, San Marzano di San Giuseppe, Lizzano, and Monteparano) the wealth of fresh produce, ritual breads, marzipan pastries, honey, and fish, and every kind of “gift of God” displayed on the tauli (tables) of St Joseph, at which everyone can take a seat and share, makes ceremonial excess a necessary element of the feast, exorcising ancestral memories of hunger. In ROSETO VALFORTORE (FG), a small enchanting village of the sub-Apennine Dauno area, 26th May is the feast day of St Philip Neri with the throwing, when the procession returns and in the presence of the saint who appears to look on in satisfaction, of bread, cheese, vegetables, fruit, and cakes over the crowd below the balcony, while wine and milk spring from the fountains: a tradition which commemorates the miraculous interventions that helped the people of Roseto overcome periods of famine. It is hard to list the whole multitude of patron saints in Apulia who constitute a multiethnic heaven as, standing side by side in a land that has always been renowned for its welcome and openness to cultural exchange, are saints from the most diverse geographical origins. Each of these saints has his own exclusive “specialisation” for the curing of physical or spiritual problems and protecting against every kind of natural disaster: Johann Goethe might have been referring to Apulia when he wrote, in his Italian Journey that “once all is said and done, you cannot but approve of there being so many saints; every believer can then choose his own and turn to him with the full faith that he is the best saint for him.” If St Blaise (Biagio) cures throats and respiratory disorders, St Donatus is called on to cure epilepsy; St Vitus protects from Sydenham Chorea known as St. Vitus’ Dance, and rabies; St Agatha the patron of the town of the same name in the Daunia area and Gallipoli, the town where one of her breasts was brought after being ripped off in her martyrdom, is called on for breast disease and lactation; St Anna protects women during puerperium and is accompanied in many Salento towns by St Margaret (Marina) who ripped open the belly of the dragon; St Irene holds up her hand to stop torrential rains and lightning; Saints Rocco and Sebastian free peoples from the plague and cholera. The legends say that St Ippazio, patron saint of Tiggiano, during an argument with the Arians that degenerated into a brawl at the Council of Nicea (325) was struck by a kick below the belt. That kick is why he is the patron saint of male virility, the cure of hernias and genital diseases. St Ippazio’s specialisation is played out in the ritual sphere through the tradition of eating “bastenache”, purple carrots typical of the area and during the feast day by the lifting of a seven metre long pole, an operation that is made even more difficult by the metal ball attached to its end. The pilgrimage of women taking their newborn male babies to the saint to ask for protection is still alive and strong in TIGGIANO (LE) and CORSANO (LE). Apulia is another region where the patronage of the Madonna is the most widespread: there is not one town, big or small, without a painting or miraculous statue of the Mother of God whether with a universal or peculiarly local title. The local titles are often linked to local legends and miracles. The Madonna is the patron par excellence: in FOGGIA she is the (seven veils), in Leuca she is de finibus terrae; in ACQUAVIVA DELLE FONTI (BA) she is the Madonna di Costantinopoli (of Costantinople) and in CONVERSANO (BA) and FRANCAVILLA FONTANA (BR) she is the Virgin della Fonte (of the spring); in MINERVINO MURGE (BA) she is known as the Madonna del Sabato (of Saturday) whereas near SPINAZZOLA (BT) and in Panni she is venerated as the Madonna del Bosco (of the forest); in GIOVINAZZO (BA) they call her di Corsignano and in CASTELNUOVO DELLA DAUNIA (FG) as della Murgia; as the patron of BOVINO (FG) she is venerated as the Madonna di Valleverde (of green valleys) and as dello Sterpeto in BARLETTA (BT). Other titles assigned to the Virgin Mary include: Incoronata (crowned, in Apricena), di Merino (in Vieste), Mater Domini (in Laterza), della Sanità (of health, in Volturara Appula), dell’Alizza (in Alezio), della Scala (of the stairs, in Massafra), della Palma (of the palm, in Palmariggi), della Coltura (of crops, in Parabita), della Libera (of the free, in Rodi Garganico). The feast days marked on the calendar emphasise the never interrupted link with the agricultural-pastoral stamp of rituals, especially in contexts where the culture and economy are dependant on the land. The Virgin Mary’s country “specialisation”, her strong link with nature and the agricultural and pastoral worlds, is almost too obvious in the topographical arrangement of the numerous sanctuaries scattered across the region of Apulia, a kind of protective network guarding the small and large towns. The protection of fields and animals is manifested by numerous spring processions, a season when the green countryside needs water to be fertile. The processions involve elaborate rituals in which the Holy images are taken from the town to the country sanctuaries and back again. A representative example: the feast day on 23 April in honour of the Madonna of Sovereto, known as the Madonna dell’acqua (of water): the “panel” with the thousand year old painting of the Madonna Hodighitria, leaves the town of TERLIZZI (BA) for the Sovereto sanctuary, where it stays for about three months. The myth of the invenzione (invention) says that around the year 1000, a shepherd found his lost sheep with its hoof stuck in a hole; when he freed it he noticed a lamp burning - this is the first wonder - in the crevice in front of the icon. A dispute arose with the nearby town of Bitonto over the ownership of the Holy panel which was resolved by turning to “ordalia” the judgement of God: two oxen were hitched to the cart on which the painting was placed, miraculously it headed towards Terlizzi, where it was welcomed by the celebrating population. 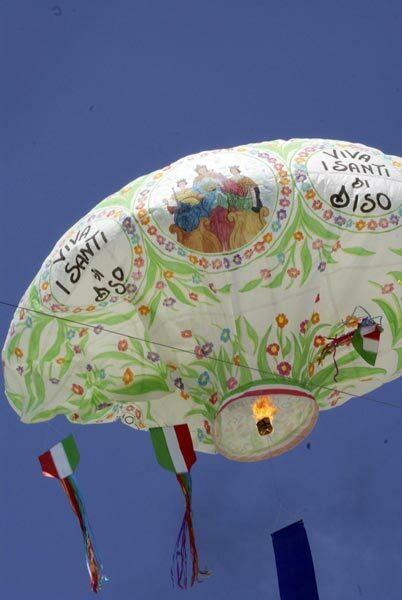 The legendary inventio is celebrated every year with an event where the mythical “cart”, which in the meantime has become a solemn Baroque bell tower over 22 metres high, carries the image in a triumphant procession during what must be one of the most beautiful and thrilling of Apulia’s religious rites. It is no surprise that in the town that links its name to floral production that the statue of the Madonna del Rosario (of the rosary) is carried by a procession that takes place on the Monday after the first Sunday in October, on an original float decorated artistically with flowers. The “carts” of a rural nature transformed into the “festive biers” characterise celebrations in honour of the Madonna del Pozzo (of the well) in CAPURSO (BA). Here the miraculous painting of the Madonna painted on the walls of a forgotten cistern, revealed herself to an ill but religious man who she cured; the statue of St Orontius is pulled triumphantly through the streets of TURI (BA) on a monumental cart drawn by mules in decorative harnesses. Patron saint festivals that involve the use of ritual “carts” to carry the Holy images are celebrated in SANTERAMO (BA) for St Erasmus (2nd June); in CASSANO MURGE (BA) for the Madonna degli Angeli (Our Lady of the Angels, 2nd August); in GALATONE (LE) for the Crucifixion (4 May); in TORITTO (BA) for Madonna delle Grazie (Our Lady of Grace) and St Rocco (4th and 5th September). Carts adorned with fruit, flowers, and land produce are set up in honour of the Madonna di Serritella in Volturino (first Sunday in May) and for St John the Baptist in MOTTA MONTECORVINO (FG). The procession of the Madonna di Mellitto in GRUMO APPULA (BA) is rather spectacular: the return of the statue to the country sanctuary, on the last Sunday in July, is accompanied by dozens of carts adorned with elaborate and creative tissue paper flowers. In CAROVIGNO (BR) the icon of the Madonna di Belvedere was found thanks to a cow that fell into a ravine; the cowherd climbed down to help it and saw it kneeling before an image of the Madonna. In his agitation he waved his handkerchief and threw it in the air. The cowherd’s innocent gesture is said to be the root behind the waving of the n’zegna (flags) that takes place during the celebrations on the Monday and Tuesday after Easter. The bull that got lost in the woods of Guagnano showed even more devoutness: it was found kneeling before the Madonna del Rosario (of the Rosary), patron saint of the town, with a rosary between its teeth. The Mary-fertile earth connection is evident in many other cults too: in CURSI (LE) the Virgin dell’Abbondanza (Virgin of Plenty) appeared to a countryman, and ensured prosperity and well being for the community by causing plentiful rain to fall after a long period of drought. The Madonna protecting PARABITA (LE) is known as “della Coltura” (of crops): the privilege of finding the effigy painted on a rock was reserved for a countryman ploughing his field near Pane. The transfer to CERIGNOLA (FG) of the splendid panel from the 1200s of the Madonna di Ripalta, miraculously found on the “ripa alta” (high cliff) of Ofanto takes place soon after Easter: the image is then re-accompanied on a long and devout country procession to its sanctuary after the feast day celebrations on 8th September. The regenerative water that suddenly gushed from the fields to quench the thirst of a devout countryman gave rise to the cult of the Madonna del Pozzo (of the Well), the patron saint of ROCCHETTA SANT’ANTONIO (FG): at the end of August the venerated statue returns to the town for the gala procession together with St Rocco. The end of the drought that afflicted GIOVINAZZO (BA) in 1338 was brought about by the Madonna di Corsignano. 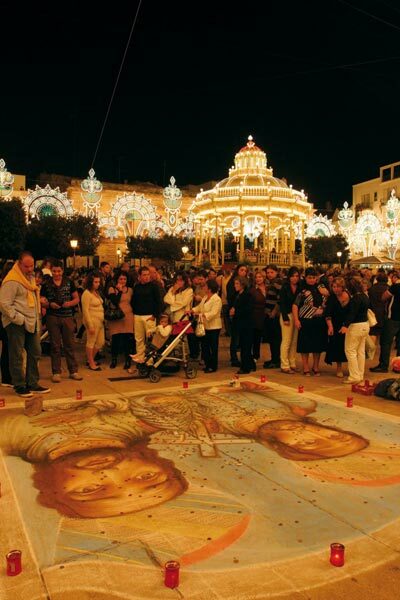 The historical parade and procession of 21st August commemorate the transfer to the cathedral in 1677 of the image of the Madonna painted on cedar panels. This Madonna was originally venerated in the hamlet of Corsignano, where tradition says it arrived in the 12th century brought back by the crusades from the Holy Land. The Madonna di Valleverde (green valleys), patron saint of BOVINO (FG) is said by tradition to have come here from Spain and ended the drought of 1888; this miraculous event is commemorated every year with a solemn procession on 23rd May. The image of the Madonna della Fonte (of the spring) was found near a spring in the area where FRANCAVILLA FONTANA (BR) later grew, she is also known as the Madonna della Neve (of the Snows): during a terrible frost the Madonna protected the olive trees which lived to germinate again. St Albert, patron of PIETRAMONTECORVINO, saved the community from the terrible drought of 1889: he appeared to some of the townspeople and to end the scourge he imposed a pilgrimage to the old Montecorvino. Since then every 16th May the statue of the sainted bishop is carried in a procession, followed by the townspeople through the green fields of wheat to the ancient church about 7 km away; the long snake like procession is preceded by the “palii” very tall poles decorated with colourful hankies held aloft and kept upright with the help of ropes. Similar agricultural reasons tinge the patronage of many other saints: trophies of oranges, mandarins, and lemons decorate the town and the statue of St Valentine, patron of VICO DEL GARGANO (FG) on the feast day on 14th February. The martyred saint is called on to protect the citrus orchards, which are the basis of this area’s economy, from the frost and hardships of winter. After the procession the faithful take the fruit that have been blessed by their contact with the Holy statue, to make healthy juices.The feast days of other patron saints are connected with pastoral cycles, especially the opening of the transhumance pastures: the merit here goes to the Archangel Michael. On 8th May and given particular importance in MONTE SANT’ANGELO (FG), the feast day celebrates the return of the flocks to the Abruzzo pastures, whereas 29th September marks the opening of the winter pastures on the plains. St Michael is worshipped as the patron saint of MINERVINO MURGE (BA) where in the depths of the Murge land a karst cavity similar to the sanctuary in the Gargano area has been consecrated to his worship; it was the livestock farmers who in 1742 financed, as an offering of thanks after an epidemic spared their herds, the beautiful silver statue carried by a procession every 29th September. The town in the Gargano area called SAN NICANDRO GARGANICO (FG) takes its name from St Nicandrus (San Nicandro in Italian): shepherds from Abruzzo brought the relics of the Roman soldier here martyred in 297. The celebrations in honour of St George in CHIEUTI (FG) a small town on the sub-Apennine slopes have a special connection with ox raising: on the feast day (23rd April) a huge eighty kilo “cacciocavallo” cheese in the shape of a ring is placed at the feet of the saint who is represented on a white horse in the act of killing a dragon. Carried by a procession, at the end of the celebrations the cheese is distributed to the public. The celebrations include a parade of floats decorated with branches of laurel, and the “palio”, an ox race, the re-enactment of the finding of the relics of St Leo. From the chapel of Monte Sambuco every (29th August) the statue of St John the Baptist, patron of MOTTA MONTECORVINO (FG) is taken out on a procession: here too the cart adorned with flowers carrying the statue is preceded by poles with colourful hankies fluttering from them. Many sanctuaries and places of worship reach a wide level of devotional importance, some have been for time immemorial the destination for certain celebrations and pilgrimages. In the Gargano area there are three especially significant locations: the Basilica dell’Arcangelo Michele (Archangel Michael) in Monte Sant’Angelo, the Basilica of San Pio (Saint Pio) in San Giovanni Rotondo, and the Sanctuary of San Matteo (Saint Matthew) in San Marco in Lamis. The prince of the heavenly host appeared more than once in the famous cave during the last decade of the 5th century if we are to believe the anonymous author of Liber de apparitione Sancti Michaelis in Monte Gargano. To persuade the doubters, he left a footprint and, on the altar a purple chlamys, without forgetting to prove his powers by causing those who are afflicted with feverish attacks to be cured if with faith and trust they drink the “stilla”, the water that filters through the walls of the cave. The constant flow of the devout has made this Holy cavern, on the route between two ends of a pilgrimage, one of the best-known and most visited sanctuaries in Christendom. The pilgrims gathered in “companies” climb to the place, especially on 8th May, where the heavenly warrior showed his power by the side of of Grimoald’s Lombards against the Byzantines, and on 29th September in commemoration of the dedication of the basilica by Bishop Lorenzo Maiorano. Today during the solemn celebrations of September the procession still carries the bejewelled golden “sacred sword”; the procession makes a number of stops and the bishop blesses all those present with the sword before replacing it in the statue’s right hand. A little less in the forefront, but no less enchanting, is the “cammino” to the grotto of the Archangel on the Gargano stretch of the Via sacra Langobardorum (the Holy way of the Lombards) which made an important stop at the Sanctuary of San Matteo (St Matthew) at the gates of San Giovanni de Lama, now known as San Marco in Lamis. In the convent the pilgrims, before being welcomed and fed, would prostrate themselves - and they still do - before the austere and ancient wooden statue of the saint. The pilgrimage to the Madonna dell’In-coronata (of the Crowned) in the forest of the same name near FOGGIA, is linked to the tradition known as the “cavalcata degli Angeli” (cavalcade of the angels): on reaching the large area in front of the sanctuary the pilgrims commemorate, on the last Friday of April, with simple dramatisations of the descent of the angels into the forest to crown the Madonna with three golden diadems. Dozens of children on decorated carts dressed as angels, prophets, saints and Madonnas, make tableaux vivant inspired by miracles performed by the Virgin Mary, and scenes from the Old and New Testament. Amongst the “minor” pilgrimages one particularly worth noting is the one in RUGGIANO (LE), a hamlet in the municipality of Salve deep in the Salento area, in honour of Saint Margaret (Marina), a beautiful young woman who became a martyr for having resisted the flattery of the governor and the demon who had forced its attentions on her more than once in the form of a dragon. On 17th July the devout walk to the church where the statue of the saint with sweet features crushes the open mouthed dragon with one foot, is venerated; after purchasing “zigaredde”, coloured ribbons outside the church, the people rub them on the statue which imbues them mystic powers, protecting those who wear the ribbons from jaundice. The pilgrimage celebrating St Donatus on 7th August takes crowds of the devout to SAN DONATO (LE) of Lecce to venerate the saint who is called upon for the healing of psycho-physical problems like epilepsy. In MONTESANO SALENTINO (LE) the object of veneration is the same saint: on reaching the church of the saint many pilgrims were afflicted by a fit followed by a state of trance. The pilgrimage in honour of St Rocco, venerated in TORREPADULI (LE) a hamlet in the municipality of Ruffano, takes on spectacular aspects: during the night between 15th and 16th August, while inside the church contact with the saint is being sought out with a dog licking the wound on his leg, outside the church a crowd of onlookers gather watching and inciting to the ever more insistent rhythm of the tambourine, the contenders who enact a frenetic dance that has become a ritual known as the “knife dance” simulating in its moves the ancient rivalries between clans. Other devout walks end at the Sanctuary of the Madonna di Montevergine, in the PALMARIGGI (LE) countryside (7th May). The town is noted for its cult of the “two Madonnas” because the townspeople also venerate the Madonna della Palma (of the Palm) as their patron saint: the two Madonnas “meet” and are carried together by the procession. The pilgrimage to the Sanctuary of the Madonna di Leuca, in CAPO DI LEUCA (LE) at the far end of Apulia preserves significant importance: the “via della fede” (paths of faith) are lined with chapels, places to eat, and places to rest; one of these is the monumental complex known as “Piccola Leuca” on the outskirts of Barbarano del Capo, a hamlet in the municipality of Morciano di Leuca, devoted to the Madonna di Leuca del Belvedere, built between 1685 and 1709. The stage of the pilgrimage stopping at Piccola Leuca was the last on the Leuca area part of the road which starting from Galatone or Sannicola (the Abbey of San Mauro), included intermediate stops at the Marian sanctuaries of the Madonna della Lizza (in Alezio), the Madonna della Coltura (in Parabita), Santa Maria dell Croce (of the Cross, in Casaranello), and Santa Maria della Strada (of the Road, in Taurisano). At the Madonna della Strada -the protector of travellers, also protected by the Madonna del Riposo (Our lady of Repose, in Alessano), della Scala (of the Stairs, in Casamassella), of Costantinopoli (of Constantinople, in Cannole Marittima), del Passo (in Otranto) - the pilgrims following the path for Santa Maria de Finibis Terrae from Galatina with stops at various other Marian sanctuaries including that of Santa Maria di Coelimanna in Supersano, all came together. The sea is the other great mythical, symbolic, economic and cultural reference in Apulia which is washed by the sea across its length and breadth as it were; as it has been from a religious standpoint too: dangers and unknown people came from the sea, as did the wealth of commerce and ideas, and another thing came by sea, exploiting the harbour, road, and infrastructures network ably set-up by the Romans: the Christian faith that arrived from the eastern world surrounded by the Ionian and Adriatic which served as a means to spread the message of the Gospels. Simon the fisherman was made a kefâs by Christ, meaning in Aramaic and Hebrew “rock-stone”, of his Church, and the places, real or legendary, where he is said to have wandered are too many to count here. In OTRANTO (LE), the most eastern city in Italy and door to the West there are churches and chapels dedicated to the prince of the Apostles, founder of communities and dioceses. Together with St Paul, the saint with the keys is the patron of GALATINA (LE), the city that still guards and venerates in its cathedral the stone where the saint is said to have sat to rest; St Paul on the other hand, in the same town performed the miracle of healing people bitten by poisonous animals (snakes, tarantulas): his feast day at the end of June is the scene of one of the most antique ancestral battles between good and evil, the latter is represented by the lethal bite of the tarantula, and the only healthy antidote was the frenzied dance performed until exhaustion. We mentioned dangers: Otranto still remembers the bloody battle against the Turks in 1480 which decimated its population. There were eight hundred “blessed martyrs” of that carnage destined to be remembered in a Christian epic: the macabre remains, piled up and open to view, are offered for public veneration in enormous cabinets in the cathedral, a monument of great beauty. Tradition places the miracle of the Crucifix kept in the Monastery di Colonna in TRANI (BT) in 1480, remembered for the Saracen threat. The tale of its foundation contains all the elements of a myth: during a pirate raid some Turks stole the Crucifix that when loaded on the ship became so heavy it sank the vessel; it was then that one of the infidels hit the face of the statue of Christ with a scimitar who to everyone’s terror began to bleed. Abandoned in the sea the Holy load reached the coast of Trani where a chapel was built in its honour. The event is commemorated every year: a simple rowing boat initiates the solemn procession on 13th May: the Crucifix, taken from the monastery is taken aboard in the nearby cove and taken to the chapel; welcomed by the bishop, populace and authorities, it is carried through the main streets of the town on the Adriatic coast. Even though located inland, the Church of Sant’Anna a VERNOLE (LE), faces the sea: a bastion defending against the Saracens whose feared raids pushed well inland from the coast. It said that the mother of the Virgin Mary did not fail to show her protection of the town when it was struck by an earthquake in 1833, by freeing it of hail in 1856, a hurricane in 1858, and cholera in 1866. The winter festival of St Anna “piccinna” (small), is celebrated by lighting bonfires and commemorates the earthquake of 1833. With the “scamiciata” FASANO (BR) commemorates another Muslim raid and celebrates the victory obtained by divine intervention on 2 June 1678: this is held on the third Sunday in May which is the feast day if the patron saint Our lady of the Well (Madonna di Pozzo Faceto) and Saints John the Baptist and Stephen. The “infidel” Saracens are fixed presences in the historical and just religious re-enactments that take place in Apulia. Often they are in memory of the secular saint par excellence, Frederick II, puer Apuliae, protagonist of one of the region’s most thrilling periods of history: in TRANI (BT) his betrothal to Jolanda di Brienne is celebrated, while in Lucera the historical parade commemorates the Angevins taking over the city from the Swabians (second Sunday in August). In ORIA (BR) hundreds of enactors take part in the historical parade and the “torneo dei rioni” (tournament of the neighbourhoods); this derives from a tournament instituted by the Swabian emperor in 1225 during a period when he was in residence in the town, a period the town displays with pride in its well-kept and mighty castle as well as other monuments. The historical parade of BITETTO (BA), with dozens of enactors in Renaissance style clothes (25th April - 2nd May) commemorates the special veneration the lord of the area, the Duke of Atri, Andrea Matteo Acquaviva, reserved for the friar of the local Franciscan monastery Giacomo Varingez, beatified in 1700: numerous miracles are attributed to the humble “blessed Giacomo” as well as the protection of the town from the plague in 1483, when he was still alive, and in later 1656. The main patron saint of Bitetto is St Michael the Archangel. During the feast day (29th September) the silver statue made by Andrea De Blasio in 1719, is carried in a procession after the rite of the exchange of the keys. On 14th June St Vitus arrives by sea from the sanctuary in the town bearing his name (San Vito): the landing of the statue is followed by the procession through the interesting lanes of POLIGNANO (BA), then the climax when the statue of the young saint during the collective commotion “ascends” lifted by an ingenious system of pulleys, to the sumptuous “triumphal bier” which is placed in the main piazza every year. At 3 pm of 8th September, the men of the sea reclaim the statue of the Madonna dei Martiri (of the Martyrs) the patron saint of MOLFETTA (BA) with great energy and a lot of commotion, almost kidnapping it form the friars of the basilica. Taken aboard the “bilancelle”, the pair of boats chosen by lottery to bear the “throne”, sail around the sea overlooked by the town, while young people dive in and perform spectacular acrobatics in honour of the Madonna. In the evening the statue is put ashore at the quayside: it is the glorification of the Virgin Mary, now completely redressed with donated gold and jewels, the statue is carried in a procession to the cathedral in an atmosphere of collective excitement. In an important seafaring and commercial town, the sea and an ancient statue of the Madonna are the protagonists of celebrations. Legends tell of the prodigious arrival of a panel bearing a painting of the Madonna on a kind of raft, giving rise to the title Madonna della Madia (madia is a kind of board for kneading dough on), carrying a precious load of wooden beams needed to make the roof of the cathedral. As the patron saint the Madonna saved the town from disease and famine. Every year the bishop, clergy and confraternities gather in the harbour to welcome the painting of the Madonna while the town erupts in jubilation at the renewal of the miracle (two dates: 16th December and 15th August). There are numerous “sea festivals” in honour of the Madonna in the towns along the coast: in Torre Vado in the municipality of Morciano, and 11th August for the Madonna Stella Maris on the Tremiti islands in honour of the Assumption. In Porto Cesareo, on 19th August a substantial fleet of fishing and tourist boats escorts the two distinguished boats carrying the statue of the Madonna del Perpetuo Soccorso (Our Lady of Perpetual Help) and Saint Cesaria. The relics and the statue of the patron saint of BRINDISI, Saint Theodore arrived from the sea and are carried in a procession on the sea: the intriguing procession takes place on the first Sunday of September. The other patron saint, the native Saint Lawrence of Brindisi, a Capuchin friar canonised in 1881 is also celebrated. The female counterpart to Saint Sebastian is Saint Christina, the joint patron saint of GALLIPOLI (LE): a martyr at just twenty, tied to a tree and shot through with arrows. She is the patron saint of seafarers and fishermen and on the feast day in her honour (24th July) the procession “by sea and by land” involves the statue embarking from the harbour on a tour around the island where the old Gallipoli stands, and after landing the procession continues through the airy streets of the new Gallipoli sumptuously decorated with illuminated decorations creating original and intriguing scenes of light. The “May festival” in honour St Nicholas the patron saint of BARI , includes the historical re-enactment of the arrival of the relics of the saint stolen in 1087 from Myra by brave sailors from Bari and their being handed over to the friars of the basilica. This is where the rite of the gathering of the “manna”, the liquid that flows from the bones of the saint, is celebrated, presided over by the bishop. On 8th May the sea procession is renewed to the sound of cannons and fireworks. During these celebrations the continual arrival of the devout, especially from Russia and Eastern Europe reminds us that the Basilica of St Nicholas is the other great Apulian terminus for pilgrims. It has been a destination for pilgrims since the Early Middle Ages when following its fame due to the miracles promised for the relics, the town on the Adriatic began to appear alongside MONTE SANT’ANGELO (FG) on the itineraries of the devout pilgrims to and from places in the Holy Land and the tombs of the Apostles Peter and Paul in Rome, on routes which pass numerous other sanctuaries of the ancient Via Appia-Traiana which adopted the name Francigena of the South. The link between Saint Catald with the fishermen of Taranto is even more explicit: the legend says that the Irish bishop arrived in Taranto when the sea was rough, apparently he calmed the waters by throwing his ring into the sea. 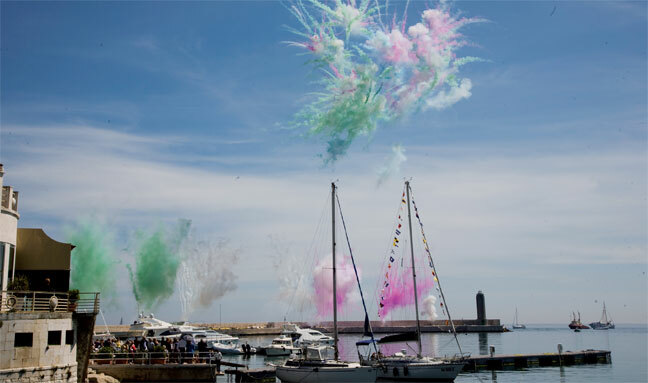 The event is re-enacted every 8th May with a sea procession: the silver statue is lifted on to a festively decorated boat and sails across the sea in front of the town receiving homage by land and the sea of the whole population. Not on the sea but the large briny lake at the foot of the Gargano peninsula the well crafted statue of St Primianus, the patron saint of Lesina, made by Giacomo Colombo, is carried in a procession. The celebrations of the young man martyred at the same time as Firmin, Castus and Larino end on the last Sunday in May with a procession of fishermen who after being entrusted with the statue initiate the characteristic regatta with the typical local salt lake boats known as “sandali” or sandals, sealing the protection of the fishing season, the driving element of Lesina’s economy. The special veneration reserved for the patron saints has inspired, over the course of the centuries and frequently in conjunction with strange “supernatural” events, the building of exquisitely beautiful religious complexes. The legend says that Nichola the pilgrim, an adolescent who was mad about God and learning, died in Trani a few days after his arrival there in 1094 at the end of an eventful and strenuous journey, yelling the prayer Kirie Eleison. The body was immediately the object of veneration and was raised to the altars just five years after his death by order of Pope Urban II, and that invocation from his dying lips soon became a prayer in stone, giving rise to one of the most surprising and thrilling Romanesque cathedrals in Apulia, purposely built to house the precious relics of the little saint. The feast day, the last Sunday in July sees the procession carrying the artistic silver statue and precious reliquary with the remains of the body in full view: the “sea procession” is traditional. The champion of “reliquary churches” though goes to the basilica in Bari built by the wishes of the Benedictine Abbot Elia to house the remains of Saint Nicholas from 1087 onwards. The temple became the model and source of inspiration for all the Romanesque architecture for the originality of its expression, a comfortable synthesis between the reigning Lombard and Byzantine traditions and the innovations brought by the northern European conquerors, which was defined as “pugliese” (Apulian). In fact the arrival of the Normans provided fertile ground for the flowering and rebirth of the towns and after a few decades the feverish activity of many building sites, at least one in every Apulian diocese, gave rise to the building of “new” majestic temples and cathedrals that still possess the power, as they did in the past, to incite deep admiration. This happy period of Apulian art immediately recalls the splendid cathedral of Troia, the most beautiful of all, with its magnificent out of scale rose window with delicate tracery; but also those of Bari, Bitonto, Ruvo, Altamura, Canosa, and Molfetta, right up to the far end of Salento, in Otranto where the cathedral, started in 1088 and dedicated to the Virgin Mary, is rendered even more famous by the splendid mosaic on the floor ordered by the bishop of the time, Gionata, in 1165, and realised by the Pantaleon monk from the nearby Abbey di Casole. In some lucky cases it is still possible to see the bronze doors to the temples, the symbolic value of these doors went beyond their practical value, marking a theological significance, the division between “here” and “there”, between man and God, the barrier or portal between immanence and transcendence, a saving opening leading to a state of grace. Alongside these monuments the network of “minor” churches is even thicker, adorned with sculptures and cycles of paintings, they cover the Apulian land. Just to mention a few examples there are the Churches of: San Leonardo (in Siponto), Ognissanti (in Trani and Valenzano), Santa Maria de Via (in Sannicandro Garganico), San Pietro dei Samari (in Gallipoli), Santa Maria di Cerrate (in Squinzano), and San Giovanni (in Patù). In Martina Franca the Baroque collegiate Church of San Martino houses the relics of the Bishop of Tours and Saint Comasia. Landing miraculously in Brindisi after being pushed off course on their way to Venice, the relics of Saint Theodore are the reason for the construction of the cathedral. Amongst the many monumental complexes the “cappellone” (large chapel) of San Cataldo in the Taranto cathedral deserves a mention. A piece of paradise on earth: beneath a sky crowded with saints painted by Paolo de Matteis, there are altars, balustrades, pillars, entire walls, and niches faced and adorned with precious marble that emphasises the theatrical poses of the marble statues worthy of the best of Giuseppe Sanmartino. From the reliquary churches to the other arts that serve to render the bond between the community and the saints tighter, more concrete and sensitive: paintings, sculptures and valuable furnishings. The thanks and appreciation of the public are often expressed in expensive donations of solid silver statues: a few examples of these are the splendid busts of St Agatha and St Sebastian in the Gallipoli Cathedral; St Sebastian in Spinazzola; the Saints Martin and St Comasia in the Collegiate Church of Martina Franca; the incredible St Quentin in Alliste; the busts of Saints Maurius, Sergius, and Pantaleon in Bisceglie; the busts of St Eleutherius, Anastasius, and Urban in the Troia Cathedral; the St Gregory and Madonna in Nardò; the St Anthony in Biccari, and the full figure statues in Monteroni and Ruffano; the St Catald in Corato, and to finish the list that could go on forever, the St Rocco of Ruvo di Puglia, made by the celebrated silversmith Biagio Giordano and designed by Giuseppe Sanmartino. Statues with an artistic and intrinsic value which are often equal to the Neapolitan silver sculpture of the 17th and 18th centuries and absolute treasures of the churches and cathedrals where they reside. They are only brought out of their safe rooms for the special feast days to receive public veneration and the admiration of scholars. 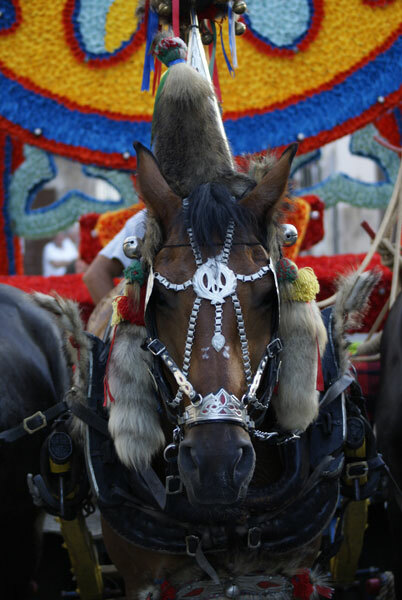 Perhaps the traditional cavalcade accompanying the statue of Orontius, patron saint of Ostuni and commissioned by the Sansone family, was instituted to protect the precious piece during the procession of 26th August: dozens of horses and their riders adorned with ribbons, caparisons, and wearing sumptuous costumes covered in rich embroidery and sequins in a colourful and exuberant parade that is almost a synthesis of Apulia’s many festive celebrations.